Four-time prime minister and octogenarian Silvio Berlusconi, announced his comeback — once again — to Italian politics Thursday. Speaking at a rally in Sardinia, he said his aim "at the beautiful age that I have" was to run in the upcoming European elections in May to stop the present upsurge of populist governments winning seats in Europe. He accused Europe of lacking "deep thinking about the world. ... With my knowledge, my experience and my ability to convince people, I can play an important role and make European citizens understand that we risk moving away from Western values." He took a similar line to when he entered politics in 1994, saying he was doing it to stop "the communists." This time, he said he's entering politics to stop the present Italian government from gaining more votes in the European Parliament — mainly in an attempt to slow down the anti-establishment Five Star Movement, a political party that he has repeatedly called "dangerous," "inexperienced" and "incompetent." 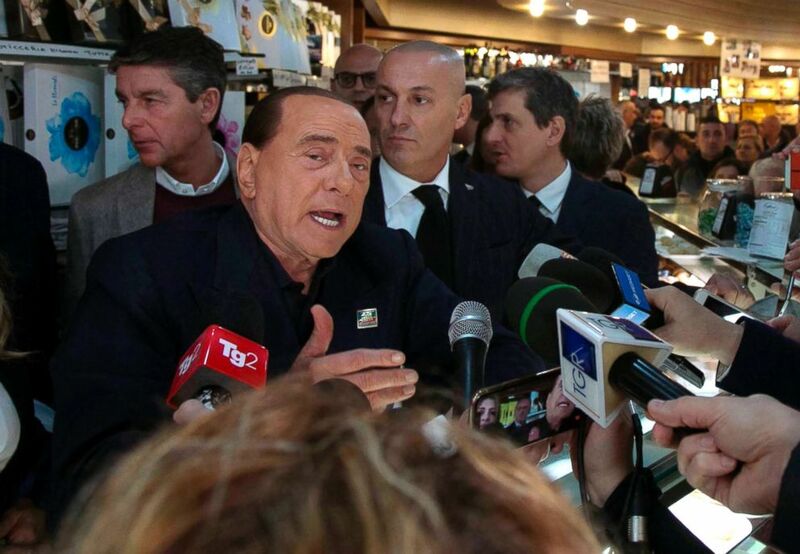 Former Italian Premier Silvio Berlusconi meets supporters in Cagliari, Italy, Jan. 18, 2019. The 82-year-old Berlusconi announced his candidacy with his center-right Forza Italia party Thursday in Sardinia. "The united #RightCenter is a winner: with its values and its ideals, it is the future of Italy, Europe and the world," Berlusconi wrote on Twitter on Friday. Reaction to the news that Berlusconi was running in the European elections were mixed, with some TV commentators on Thursday complimenting him on his "courage" and others dismissing it as delusional move. However, political analysts believe that his running in EU elections could still mean a 5 percent increase of votes for his waning Forza Italia party, which could give the wily politician a political bartering tool going forward. A pollster, Nicolo Piepoli, quoted in Corriere della Sera on Thursday said "his return to politics helps maintain [his party’s] votes not win but you must not forget that there are still a million citizens who would risk their lives for him today."